Yes! 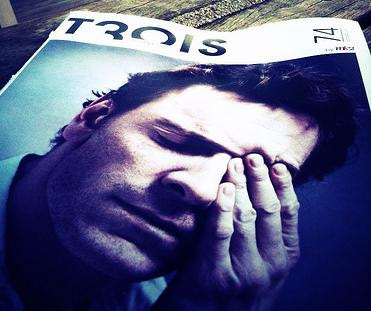 new Fassy images from Trois 74, a french movie magazine. Thanks to the Anonymous poster. 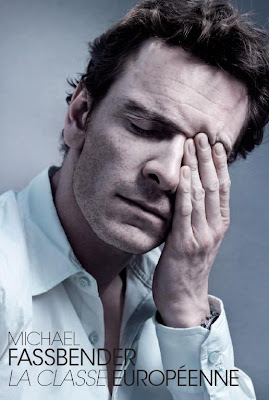 I was able to go to the link she/he provided, and downloaded the pdf of the Trois Fassbender article. And Voila! Click here to read the interview - if you can read in French. In the past week, I had a birthday, two job interviews, quit one part-time job and replaced it with another one, worked 60 hours, enjoyed the new Pearl Jam cd, and was digging for new Fassy news. I hate it when I can't update FF at least twice a week - but, I found a little something today. Every city has a cool Free weekly/monthly entertainment magazine, and I discovered this morning that Michael was featured on the #74 issue of Trois magazine, an MK2 freebie in September. I wrote a message to the person who posted the cover on flickr to see if there was an accompanying article with Michael's cover. So if I hear back from the person and they fill me in on what the magazine is about, I will let you all know too. But other than that, Michael has been seriously on the down low. He did all his work and promotion for Inglourious Basterds and Fish Tank, and now he is nowhere to be found. I read gossip blogs like how people drink water, so I'm always reading about the same celebrities doing the most mundane or silly stuff. Like I read how Gerard Butler was seen coming out of a cafe in LA. Ok, big whoop! But if the paps can spot him in LA all the time (probably because he encourages the pap keeping tabs on him), why can't any of the 10,000 paparazzi catch Michael filling up his car with petrol, or going into Burger King, or shopping at Target? He's human like the rest of and does regular people stuff just like everyone else. But there's not one picture or comment about him doing anything or being anywhere, and he spends a lot of time in LA now. I know it's weird to want to see him out and about, but it's only because it provides generic fodder to help keep FF updated and appease Fassinators with nice updates on what Michael is doing. These long droughts of nothing is so not cool. This past weekend, Inglourious Basterds inched closer to the $120 million US box office mark and in doing so, it is gaining more Oscar talk strength. In the upcoming Oscar season, 10 films will be listed as nominees for Best Picture, and as per recent discussions at Awards Daily, Inglourious Basterds has been listed in their top 10 list. And based on some of the comments, some fans strongly believe that Basterds could go all the way. I personally think it could merit a Best Picture nomination, but I don't know if it could actually win. Far too much bs and politics go into a film actually winning, so, only time will tell. And in other Michael movie news, Fish Tank will be featured at the Chicago Film Festival next week and it made Chicago Tribune's Top 10 films to see at the festival. And although I mentioned on FassFass over a week ago, it appears that Blood Creek was only at the second run theaters for like 5 whole days. What a shame. It was a decent horror film and to see it so poorly marketed is ridiculous, especially since Michael Fassbender is such a rising star and featured in two currently running well respected films. I will keep my eyes and ears open for new Michael news, but I need your help too. Please just email me if you find something or if you have a question that you want to ask and I will try to answer it and post it here at FF. The miracles of the internet. I went to Babelfish Translation Altavista, and they have the option to translate an entire damn page. So I opted for the French to English, and voila! Here's the Trois #74 Michael article. Yeah! Please note that the translation is not perfect, but it allows you to read and understand the article much better. It is also possible to download a pdf file of the magazine. You can see the link on the website. It has a new picture i haven't seen before. Thank you. I bow to you 1,000 times. I'm trying to download the pdf right now. Michael will be an adjudicator for the Kerry Film Festival 2009. Information here at this link http://www.kerryfilmfestival.com/index.html. Thanks Maura. I posted this on the FassFass twitter a few days ago, but I'll remind everyone about it in the latest blog entry.